Annual gutter cleaning is the easiest and best way to keep your gutters working for you. Our eavestroughs and gutters perform an essential service for our home, but when they fill up with debris and dirt, they can actually do more harm than good. Water damage from dirty gutters is all too common in Vaughan today, and extremely expensive to fix. NICK’S Window Cleaning has over 10 years of dedicated gutter cleaning experience. Fully insured and trained in the best gutter cleaning techniques, our professional cleaners can help your gutters stay in their best shape for years to come. When your gutters are clean, they help to safely drain water far away from your home. When they’re dirty, however, they can actually do damage to your home. Water can overflow into your home’s roof, walls, basement and foundation, leading to expensive and entirely preventable damage.s that need immediate attention. If you want to avoid these types of costs, it’s best to hire professional eavestrough cleaners for spring and fall gutter cleaning services. We feature an annual schedule program so that you don’t have to book an appointment every year. Instead, we come annually an clean your gutters. Our extra services are designed to help you get the most out of your clean eavestroughs. Downspout guard installation: These guards help direct the flow of water in your gutters. A one-time service, it keeps water where it’s supposed to yearlong. Eavestroughs flushes for gutter inspection. These help us discover leaks, we can then fix any problems we encounter, either through sealing or replacement. We have high quality sealing for corners and joints. This helps stop water from seeping where it shouldn’t and stopping small problems before they get bigger. NICK’S Window Cleaning offers two kinds of eavestrough cleaning service depending on your needs. The first is standard residential cleaning. Here, we clean out your gutters by hand using an extra soft soap. 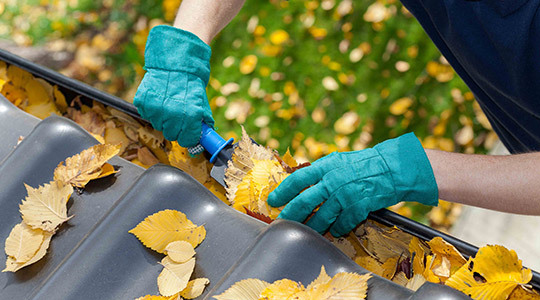 Doing it by hand ensures every tiny piece of dirt or grime is removed from your gutters, so they can work properly. The second is for post-construction sites where the gutters are extra dirty. In these situations, we clean eavestroughs with a speciality liquid cleaner that breaks down almost any stain. The result is extra clean gutters that work like they were installed that day. No matter the service, all of our staff are trained and experienced to do the job properly. Plus, we pride ourselves on being fully insured for extra protection. We do the job right and we do it safely. Providing eavestrough & gutter cleaning services in the Vaughan region, NICK’S Window Cleaning serves all commercial and residential properties with a maximum height of 3 storeys tall. Our team of experts ensures that your property looks beautifully clean, and has a clean eavestroughing and gutter system which allows for effective, proper water drainage. The NICK’S Window Cleaning team is proficient, fully-insured, and professional. Customer satisfaction is very important to us, we strive to build long-lasting relationships with you and all of our customers. We do this by providing to you a high-quality service which you can depend on. Need your gutter or eavestroughing cleaned? Give us a call and join our growing Vaughan customer base. Mold is every homeowner’s nightmare. Mold remediation is a very expensive and time consuming process. Once mold gets into your home it will infect the entire house. Cleaning isn’t enough to get rid of mold. It needs to be eradicated fast. Eavestroughs are a breeding ground for mold. The standing dirty water trapped in the eavestroughs can accelerate mold growth. Hiring a professional to get rid of that water and keep the eavestrough clean will prevent a virulent mold infestation in your home. A professional will get the kind of results that you as a homeowner just can’t get. Professional cleaners have access to the best equipment and cleaners to totally clean your eavestroughs. With powerful commercial grade vacuums and other tools they can get rid of all the water, dirt and debris that you just can’t get rid of on your own. Instead of taking on such a dirty and time consuming job let professional who have experience do it for you. The cost is low compared to the cost of the time and effort that you would have to put in and they will get much better results than you could get on your own. Water is a foundation killer. Even a little bit of water that seeps into the foundation of your home can damage it. If water from clogged downspouts or eavestroughs leaks into the foundation that water combined with the weather can start to cause small cracks all through your foundation. A professional can get rid of that water and keep your eavestroughs clean so that there is no damage to the foundation of your home.